Here you will find our waiting room expectations and policy on late cancellations. Please call is at 203-205-0305 if you have any questions. We truly appreciate all the families who support us here at the Social Learning Center and find it a joy to work with everyone while seeing our clients grow. 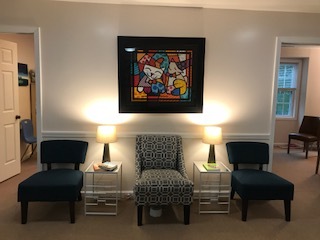 While we certainly empathize and understand that clients/clients’ siblings may need things to do to pass the time in the waiting room, we feel it’s important to re-enforce our waiting room policy. Due to privacy laws and HIPAA regulations we are reminding everyone that all clinician offices/therapy rooms remain OFF LIMITS to families or siblings while the client is in session or group. Please remember it is the parent’s responsibility to make sure their children DO NOT wander in and out of the rooms. It is also the family's responsibility to ensure their child does not engage in running up and down the hallway. These actions can cause for a major disruption during a session. We are enhancing our play area by the front door with toys/games for little ones to play with while they are waiting for their family member. If parents are aware of certain toys/games that a child may have at home that helps to occupy them, please feel free bring them along so they have something to do to pass the long waiting period. At a parent’s request, we have Wi-Fi available in the event that your child is using an iPad (we do ask that headphones or a low volume be used with these devices). You can obtain this password at the front desk. We have businesses below us that are very understanding that we work mainly with children; however, we want to ensure that there is not an excessive amount of loud noises or ANY running through the hallway/waiting room. These types of occurences can be very distracting and sometimes alarming to the people below us. We at the SLC Counseling Associates wanted to take this opportunity to inform our clients that our 24 hour cancellation policy will be enforced more consistently this year, due to an increase in clientele and referrals. Exceptions will be death in the family, accident involving a car or hospitalization, or extreme weather conditions. You will be charged a "late cancellation" fee of $60 unless you and your clinician can reschedule the week of your original appointment. Please remember our clinicians are extremely busy and we cannot guarantee that a time slot will be available. If that is the case, and a make up time can not be found, the cancellation fee will be applied. Under extreme sickness (vomiting, high fever, flu) please call the office as soon as you believe you/your son/daughter will not be able to make it in. Each family will be allowed 2 late cancellations due to extreme sickness before the late charge is applied. Multiple cancellations in a row for any reason may result in a discontinuing of services. New appointments can not be scheduled or fulfilled until the late cancellations fee has been paid. The counselor working with you/your child promises to support and do their best to help clarify what it is that you/your child want for yourself/themselves. An appointment between client and counselor is an agreement and a responsibility.The counselor is responsible to be at the appointment to provide counseling services just as the clients is responsible for being at the appointment. If, for some reason, the counselor needs to cancel the appointment, the client will be notified as soon as possible. In the event the clinician cancels the appointment, the client is not responsible for payment of that session. Please contact Lisa at 203-250-0305 if you have any questions or concerns.